Cody Willoughby | Piqua Daily Call Fifth graders Brianna Cox and Kelsi Stahl hang ornaments at the top of a Christmas tree while standing atop a hydraulic lift during a visit with other Piqua Central Intermediate students to Hartzell Propeller on Friday in Piqua. PIQUA — The holidays were kicked off in high spirits at Hartzell Propeller on Friday, as the staff received the enthusiastic assistance of select students from Piqua Central Intermediate School. In order to participate, PCIS fifth graders were instructed to write an essay on the topic, “What the Holiday Season Means to You.” Each essay had to detail what the student could do to spread kindness and goodwill during the holidays, and how their effect of their actions would make them feel. Twenty-six winners were selected to attend. “We look for good content and try to pick out the best from each class,” said Hartzell sourcing manager Jennifer Hughes. While at the Hartzell Propeller facility, participating students built gingerbread houses, engaged in window and cookie decoration, wrapped presents, constructed ornaments, and decorated the Hartzell Christmas tree with the help of a hydraulic lift. A tour of the facility was also offered, followed by a complimentary lunch and the reading of a Christmas story. According to Hughes, the event has become an annual tradition borne of a partnership that Hartzell has now maintained with schools in the community for decades. 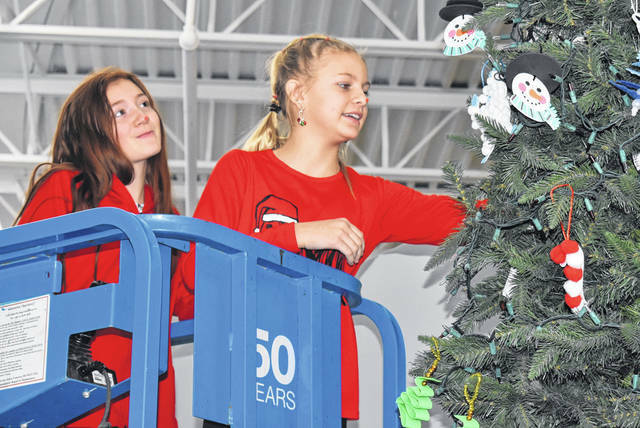 https://www.dailycall.com/wp-content/uploads/sites/30/2018/12/web1_HartzellHoliday1.jpgCody Willoughby | Piqua Daily Call Fifth graders Brianna Cox and Kelsi Stahl hang ornaments at the top of a Christmas tree while standing atop a hydraulic lift during a visit with other Piqua Central Intermediate students to Hartzell Propeller on Friday in Piqua.